The greenside bunker shot is one of the most feared shots in golf. The angle is difficult, the terrain is uneven, and the green looks so close but feels so far away. A lot of golfers face those greenside bunker shots with dread. However, if you know a few basic concepts, you can start to approach this tricky lie with more confidence. My goal is to simplify the greenside bunker shot for you. 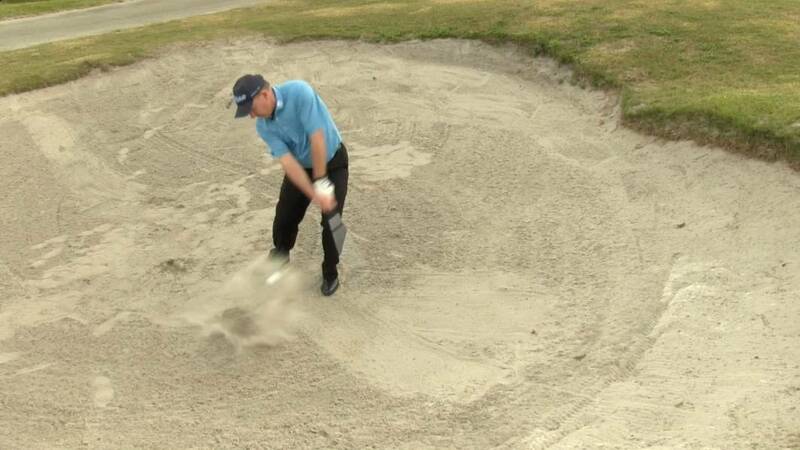 When you see your ball land in the sand, your mind likely starts reeling. How can you make solid contact with the ball in those conditions? How can you launch the ball high enough? Fortunately, the solutions are simpler than you realize. I’m going to share some basic concepts that will help you approach your greenside bunker shots in a whole new way. Once you start putting these tips into practice, you’ll have an easier time getting that golf ball up onto the green. You may even knock it in and save a par. Most importantly, you’ll finally eliminate the fear of the greenside bunker shot. I’m going to walk you through the steps of a solid greenside bunker shot, including club selection, setup, and motion. But first, let’s clarify exactly what your objective is in every greenside bunker shot you take. You may think your objective is obvious. You want to get the golf ball up onto the green, right? Definitely. However, you achieve this by focusing on an entirely different goal. When you approach a greenside bunker shot, you want to think about throwing the area of sand around your golf ball out on to the green. In other words, when you’re looking at the ball, imagine drawing a square in the sand around your ball. Your objective is to send that entire area of sand onto the green. In fact, you don’t even want to hit the ball at all. 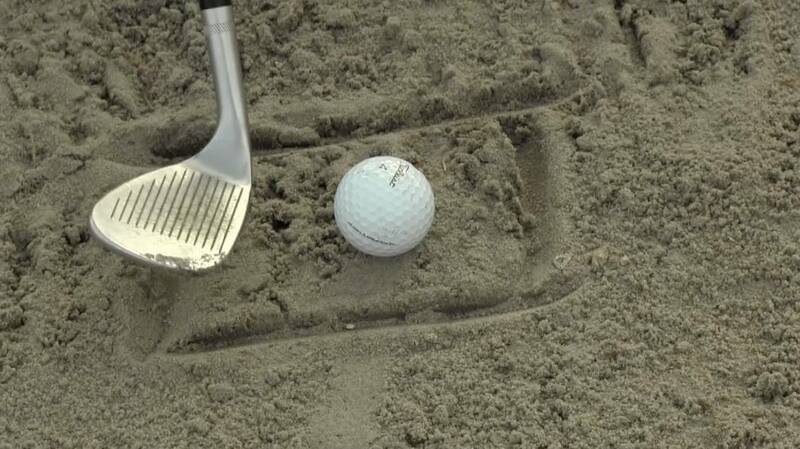 Focus on hitting that area of sand, and the sand will carry the ball with it. If the sand makes it onto the green, your golf ball will, too. 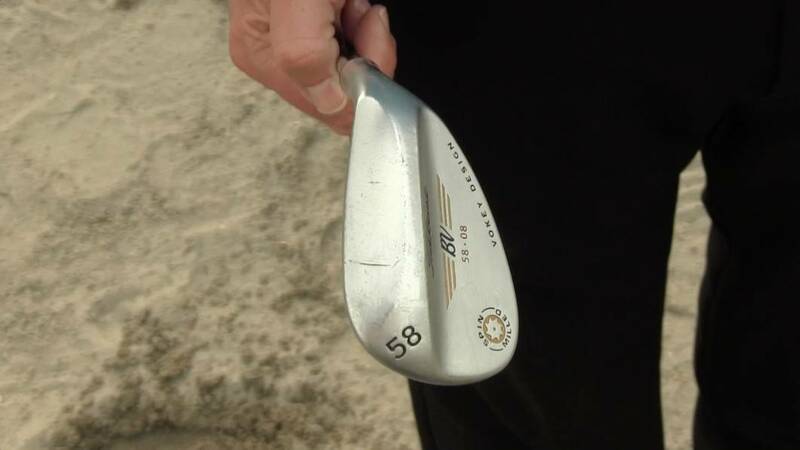 Of course, in order to get anything up out of that greenside bunker—sand or ball—you need the right club. I don’t need to tell you that a high launch angle is crucial to getting that ball out of the bunker. To get that high launch angle, choose a high-lofted club. I typically come at those bunker shots with a club that has a 58-degree loft. If you use something with a similar loft, you’ll be good to go. Now, to make the most of that high loft, you need proper setup. 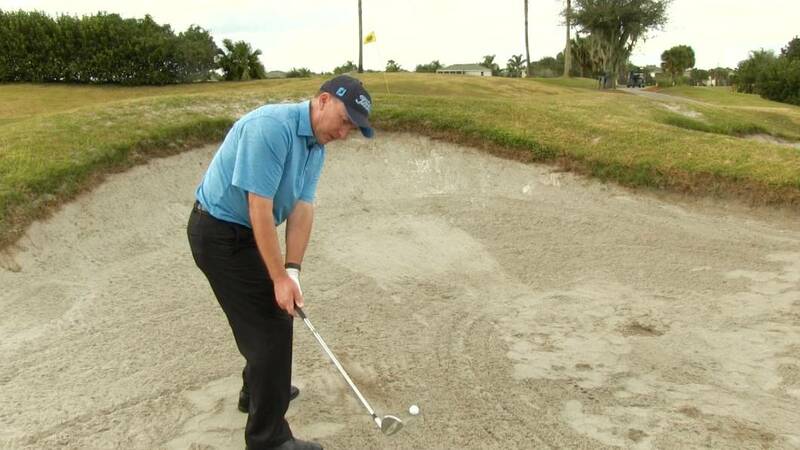 The setup for a greenside bunker shot is noticeably different from your regular golf setup. Here are the important elements you need to keep in mind. For a greenside bunker shot, you’re dealing with an entirely different turf. So, when setting up your shot, the first thing you want to think about is creating a solid base for yourself. This will help you stay balanced and steady in the sand. To create that solid base, take your stance just a little wider than you normally would. Flare your toes out slightly and put a bit of bend your knees. You should feel strong and stable in this position. If you’ve been reading my other articles or watching our instructional videos, you know how important it is to think about the placement of pressure in your feet. The distribution of pressure influences the motion and power of your swing. In the case of the bunker shot, controlling the pressure in your feet is key to controlling where the club enters the sand. For this shot, you want 60%-70% of the pressure to be in your lead foot. Since you are in a position with your knees slightly bent, it may help to think of feeling that pressure in the lead thigh. Now, you probably know that for most other shots, the pressure shifts throughout the swing. That is not the case for the bunker shot. You want to feel that 70% pressure in the lead thigh and keep it there throughout the swing. Hopefully, you’re used to placing the ball in the center of your stance on a regular golf setup. For this shot, you want the ball slightly forward of center. Think of where the logo is (or would be) on your golf shirt. Position your stance so that the ball is directly beneath that logo. 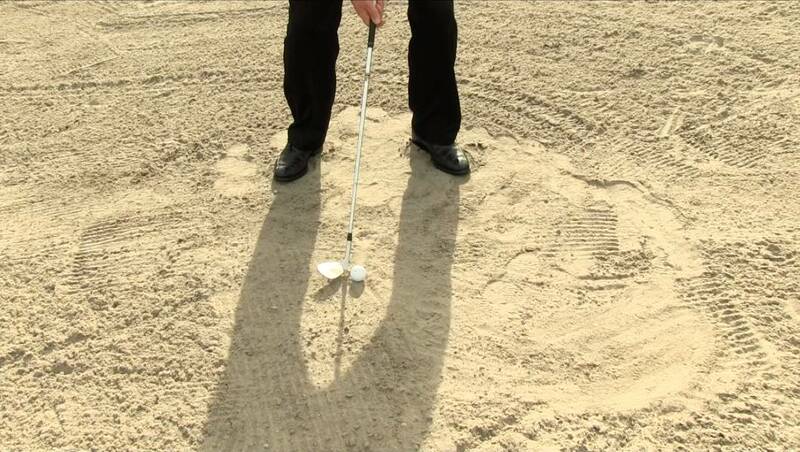 This will help you reach that overall objective of hitting the sand first so the sand carries the ball onto the green. Finally, hold your club so that the clubface is slightly open. In other words, if you are right-handed, aim your clubface—and your stance—a little to the left. Now you’re setup for a great bunker shot. All you need now is the perfect swing motion. 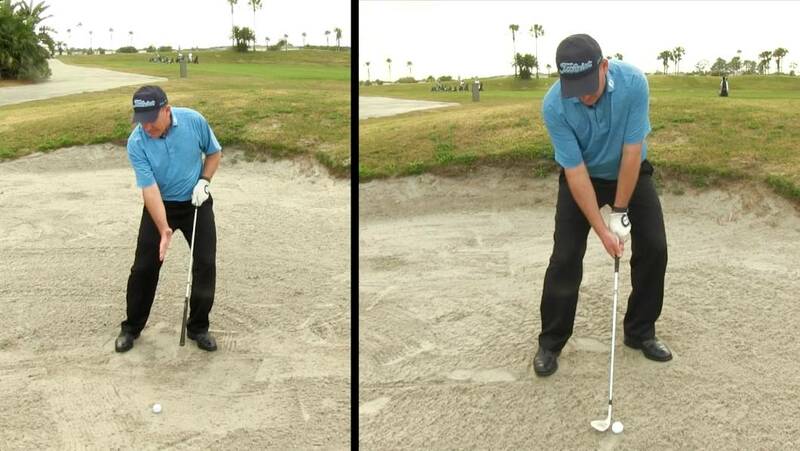 There are really only two important concepts to keep in mind when making a bunker shot. First, as you swing away from the ball, you want to keep the clubhead outside your hands. If you saw my video on chipping shots, you’re familiar with the concept of “the catcher’s mitt.” Imagine yourself standing in the batter’s box. When you swing back, visualize the clubhead moving into the imaginary catcher’s mitt. 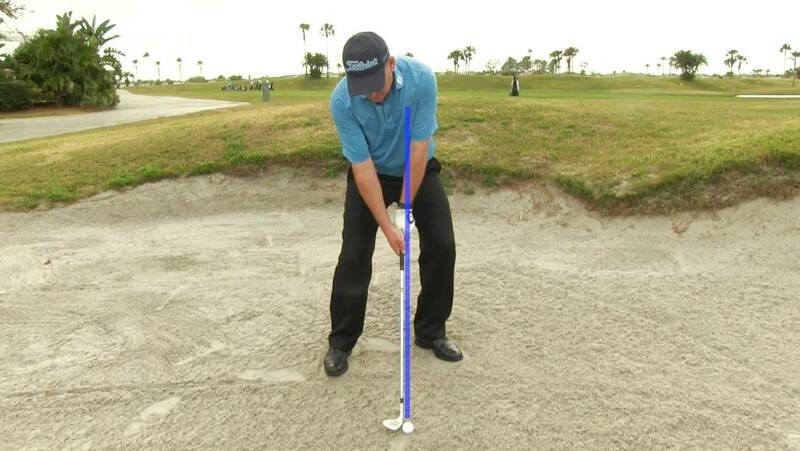 Second, when you swing through, allow the clubhead to splash through the sand. It may feel counter-intuitive at first. After all, you’re trying to move the ball . . . and you’re trying to move it up and out of tricky lie. Kicking some sand around may not feel like the solution. But trust me: If you focus on throwing sand onto the green, the sand will take the golf ball with it. That was the comprehensive version of How to Hit Greenside Bunker Shots. Now, let’s recap and bring it back to the basics so you have an easy checklist to review greenside bunker shots on the golf course. Throw sand out onto the green. The sand will take the ball with it. Choose a high-lofted club (around 58 degrees). Make your stance a little wider than normal. Flare your toes out slightly. Feel 60%-70% pressure in the lead thigh. Position ball slightly forward of center in your stance. Aim your clubface and stance slightly to the left of the target (for a right-handed golfer). Allow the clubhead to splash through the sand just behind the ball. The more your practice this technique, the less you’ll have to think about incorporating all these steps and the simpler these solutions will feel. Before you know it, you’ll have eliminated the all-to-common fear of the greenside bunker shot. Have you tested these tips? Do you have any questions? Anything you read here that you disagree with? Let us know in the comments. We’re always here to answer your questions – or engage in a friendly golf debate! For more tips and golf news, follow us on Instagram and Facebook and subscribe to our YouTube channel. We’re constantly adding new content designed to help you play better golf. I love your instructions on chipping and sand play. One question though, “Do you watch the sand behind the ball, or the ball itself.” This totally baffles me when I am in the sand. Thanks for your question and supporting our coaching. I hope you are finding it helpful. I suggest you focus on the sand slightly behind the ball. Think in terms of throwing a “dollar bill” size area of sand out onto the green. This will help your focus be on throwing the sand vs the ball which will be a great help.